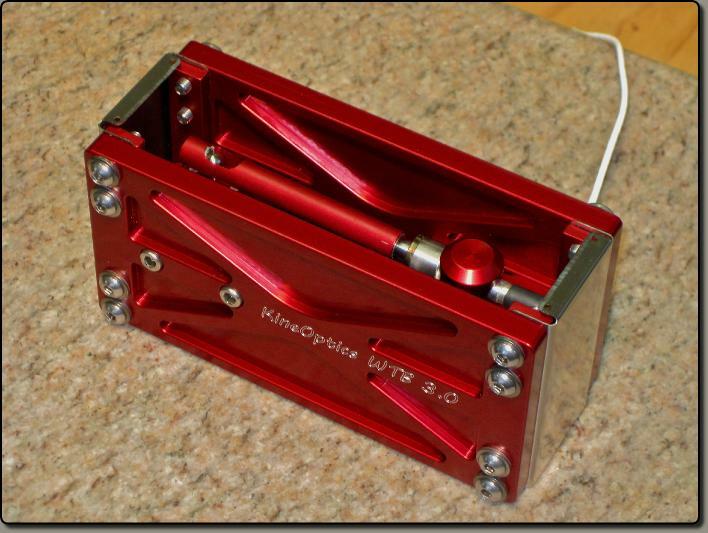 The KineOptics WTB 3.0 is a simple, cost effective Wind Tunnel Balance system. This component balance will accurately measure small forces, typically lift, drag, and pitch moment, in wind tunnels and water tunnels. The WTB 3.0 is ideal for small UAV testing, airfoil testing, and small RC models. Other uses have included building models, tree leaves, and underwater devices. The KineOptics Wind Tunnel Balance utilizes a very flexible open architecture design in that the basic isolation axis can be configured in multiple axes and with various thickness flexures and load cells suitable to the intended application. 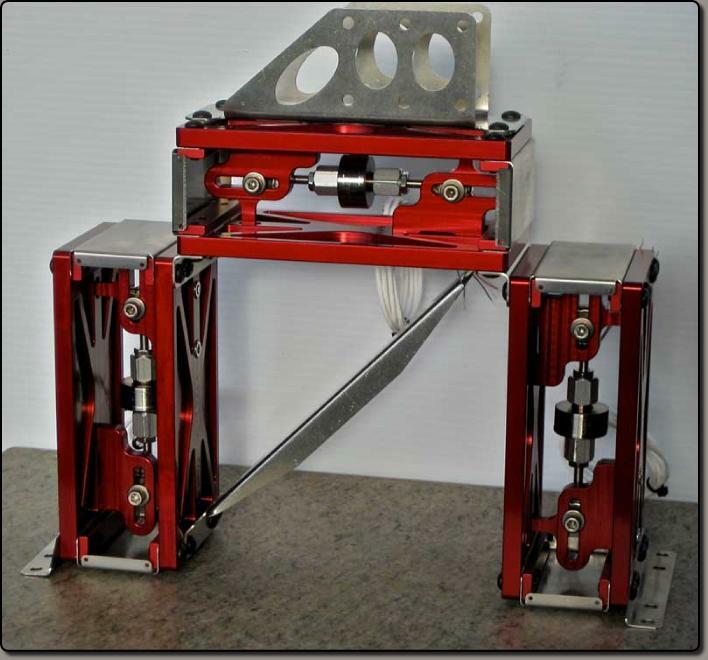 Each Component Balance Axis has a hard stop to prevent overload of the flexures when the load cells are not coupled and the balance is accidently bumped when setting up models. The KineOptics WTB design is manufactured from anodized aluminum and 300 series stainless steel. It is designed for harsh environments in both wind tunnels and water tunnels. The KineOptics WTB design is difficult to damage if accidently overloaded but care must be taken when the load cells are coupled as load cells can be overloaded. KineOptics does have a special design for mounting Sensotec Model 11 Load Cells. This mounting design incorporates full protection of the small Sensotec 0-250 gram load cell while providing accurate measurement of small forces.The WTB 3.0 is designed to measure forces in various ranges, depending on the flexure and load cell configuration. The maximum for the WTB 3.0 would be 0-35kg. The lowest forces would be in the sub gram range. This is using our Sensotec 0-250 gram load cell. The WTB 3.0 is sold on a component level. Each axis can be purchased separately. An axis unit does not include any load cells or load cell attachment hardware. We can design and supply mounting hardware for your particular load cell requirements for additional costs. We also sell an Angle Kit to join the two units together to form a "Lift / Drag" measuring assembly. This is the conventional arrangement. There are other arrangements possible such as a three unit assembly for lift, drag, and pitch moment. The WTB design is modular so parts are replaceable if damaged by an accident. The WTB 3.0 is a semi-stock item. Depending on the configuration, shipping will take 2 to 8 weeks. E-mail or call for more information. KineOptics can supply larger models to meet your specific requirements. Please contact us regarding this or any other matter. Please send us an e-mail to request a copy of the WTB 3.0 operations manual. Sensitivity and accuracy of the WTB 3.0 is usually limited by the analog load cells and signal conditioning equipment. In testing, we have measured loads as small as .1 grams. Contact us for more information regarding what can be expected depending on configuration. 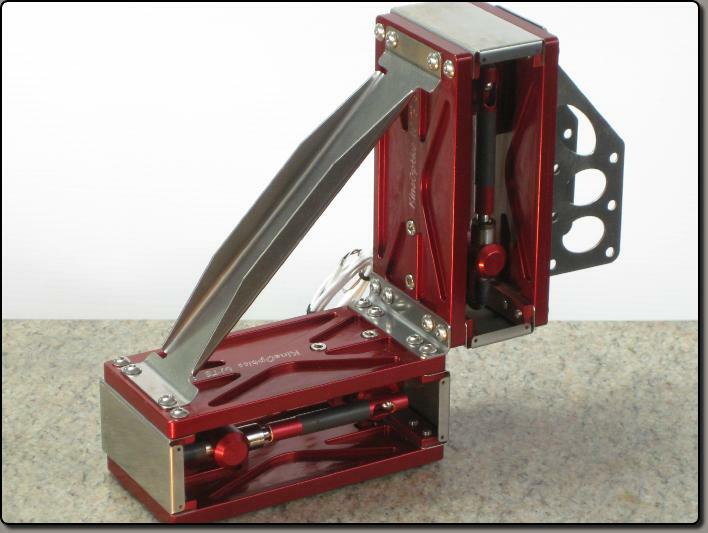 Click here for instructions for using the Tilter with a 250 gram load cell and a GM indicator. Sensotec 250 gram load cell. Mounting angles or model support bracket not installed. 250 gram load cells and overload magnet rod installed. Angle Kit, Model Support Bracket, and Mounting Angles. Shown mounted are three Sensotec 25 pound load cells.